"Three-card Monte - also known as find the lady and three-card trick - is a confidence game in which the victim, or "mark", is tricked into betting a sum of money, on the assumption that they can find the "money card" among three face-down playing cards. It is the same as the shell game except that cards are used instead of shells. In its full form, three-card Monte is an example of a classic "short con" in which a shill pretends to conspire with the mark to cheat the dealer, while in fact conspiring with the dealer to cheat the mark. The mark has no chance whatsoever of winning, at any point in the game. In fact, anyone who is observed winning anything in the game can be presumed to be a shill. This confidence trick was already in use by the turn of the 15th century." 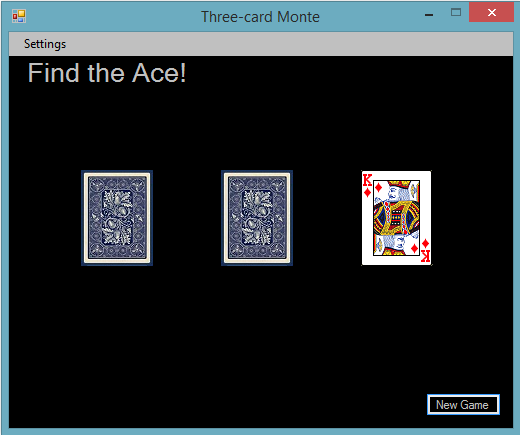 This is a card game based on Three-card Monte, with the exception being, this is the honest version. This control is hosted in a menuitem and used for setting the speed of card shuffling. This example shows how to create a lightweight GDI+ card game, with simple animations.